First, some broad national understanding of the Millennials and Generation Z: the Pew Research Center has an excellent series on research and analysis of these two generations. As someone who has watched these trends for some time, I believe these generations will have a tectonic shift on the country's (and thus the Old North State's) political environment and dynamics. The following national data comes from the 2016 American National Election Study (ANES), which you can find the data and do your own number crunching via this webpage. 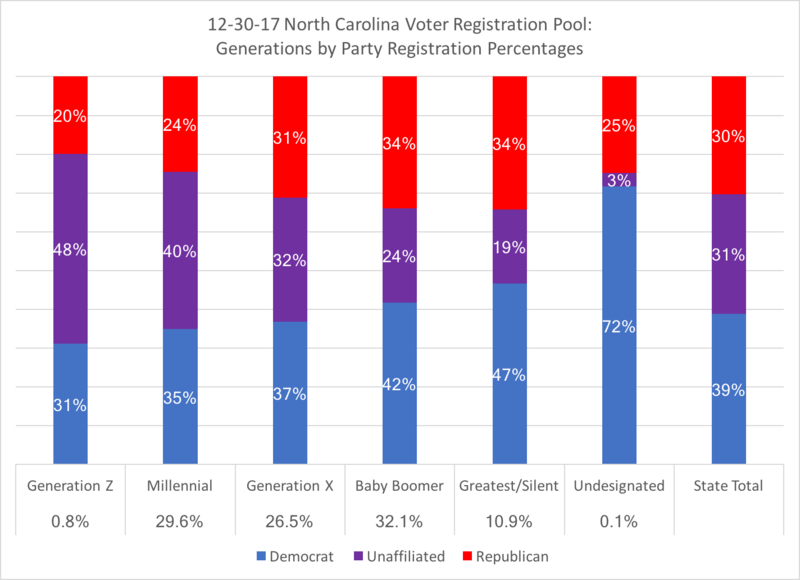 First, to give some context to the NC registration figures that I'll present below, I looked at the electorate breakdowns by generations within the 2016 ANES Data. For purposes of defining the generations (see above for Millennials and Generation Z, which I am combining for the remainder of the analysis, unless noted), Generation X cohort are those born between 1966 and 1980, Baby Boomers are those born between 1945 and 1965, and the Greatest/Silent generations were born before 1945. 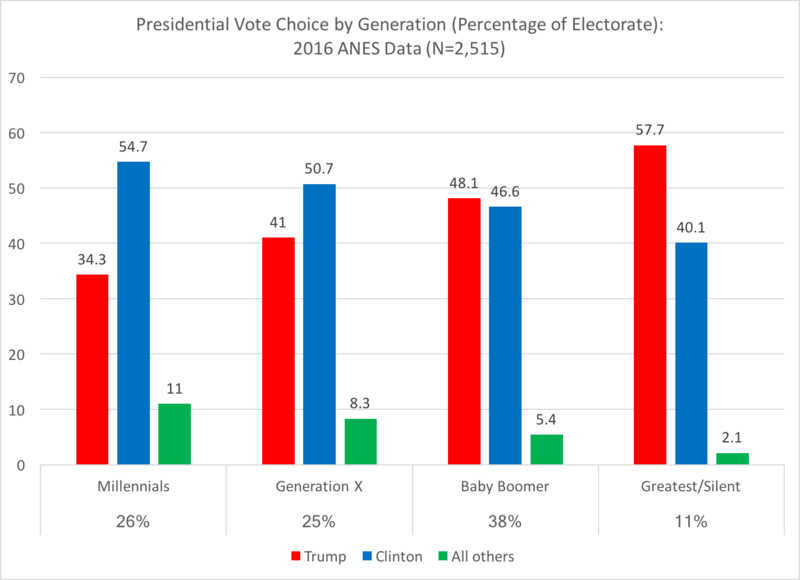 As has been found by Pew and others, Millennials trend more Democratic in their voting patterns, and we see this in the fact that nearly 55 percent of this generation cast their vote for Hillary Clinton, while at the other end of the generation spectrum, those of the Greatest/Silent generation were a mirror image for Donald Trump (nearly 58 percent casting their vote for the Republican presidential candidate). Another interesting facet of Millennial presidential voting: they recorded the highest generational support for third party candidates (11 percent). Conversely, while Generation X were more Democratic in their vote choice, Baby Boomers (the plurality of the electorate at 38 percent) went slightly more Republican than Democratic. Within the 2016 ANES data, respondents were asked about their self-identification with the major parties, or their "independence" from either the Democratic or Republican parties. In looking at the generational differences, the starkness of party self-identification is most prominent between Millennials and the Greatest/Silent generations. While the highest numbers of self-identified "strong partisans" is among older voters (25 percent self-identify as "strong Democrats" and "strong Republicans" each), younger voters self-identify with the highest rate of "pure independents" (18 percent) within these generational cohorts. But in looking at the strength of partisanship within national Millennials, "strong Democrats" are 18 percent of that generation to only 11 percent self-identifying as "strong Republicans." Not surprising, 2016's "strong partisans" voted 95 to 97 percent for their party's presidential candidates, while "not very strong partisans" voted three-quarters of the time for their party's presidential candidates. But in looking at the independent 'leaners', their partisan loyalty to the party they leaned to was 80 percent. 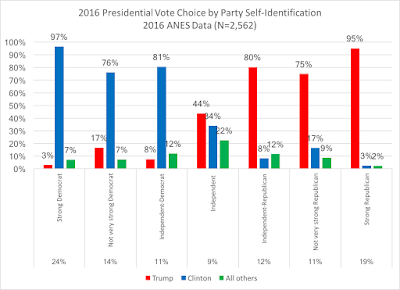 Only "true" independents split their vote, and a significant number (the most within the party self-identification groups) went for a third-party candidate. Again, partisan loyalty is evident in both those who identify as a partisan (97 percent for strong Democrats, 78 percent for not very strong Democrats, while 89 percent for strong Republicans and 75 percent for not very strong Republicans), and also among independent "leaners" (three-quarters of Independent Democrats for Clinton and 70 percent of Independent Republicans voted for Trump), but among pure independent Millennials, the plurality cast their votes for Clinton, while 25 percent of them cast votes for third party candidates. Another important observation is that among the Millennial electorate, 56 percent were Democratic (strong, not very strong, or independent leaning) in their party self-identification to 36 percent identifying as Republican (again, strong to independent leaning). 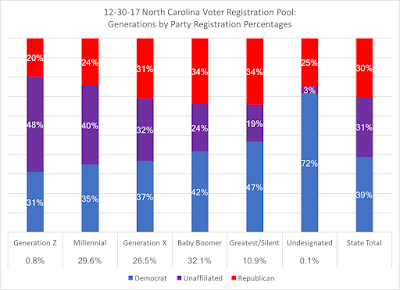 So, this national context sets up the following analysis on North Carolina's voter registration pool with a focus on Millennials. 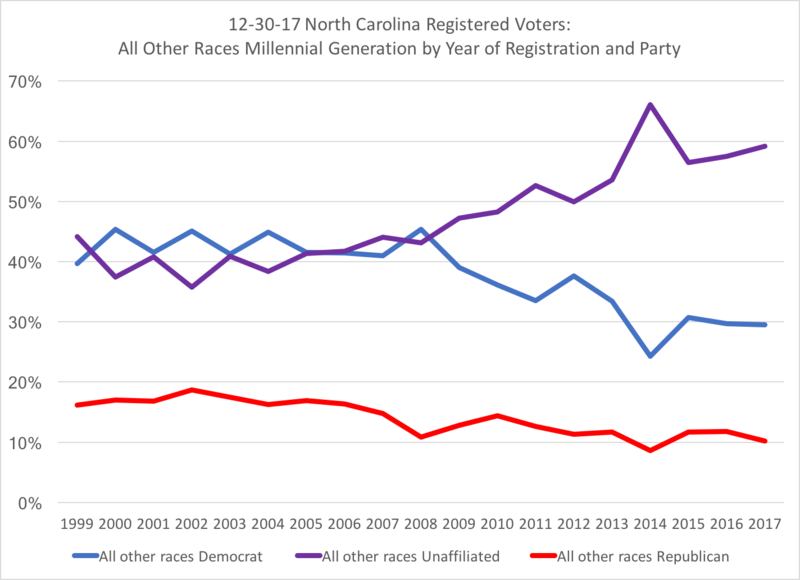 The following data comes from the North Carolina's active and inactive voter registration information provided by the NC State Board of Elections, in which I took the 6.8 million active and inactive voters and recoded each voter into generational cohorts and various demographic characteristics (gender, race, and party registration). 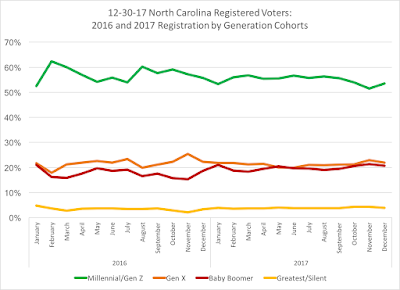 As noted previously, Millennials and Generation Z registered voters are now 30 percent of the NC voter pool, while Baby Boomers are 32 percent of the pool, as we enter 2018 in North Carolina. 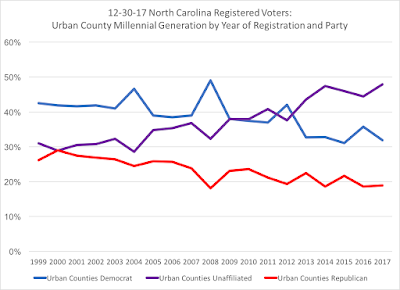 While Democrats see a bump in their party registration in presidential election years, unaffiliated registration has grown considerably over time, with party registration for both major parties declining. 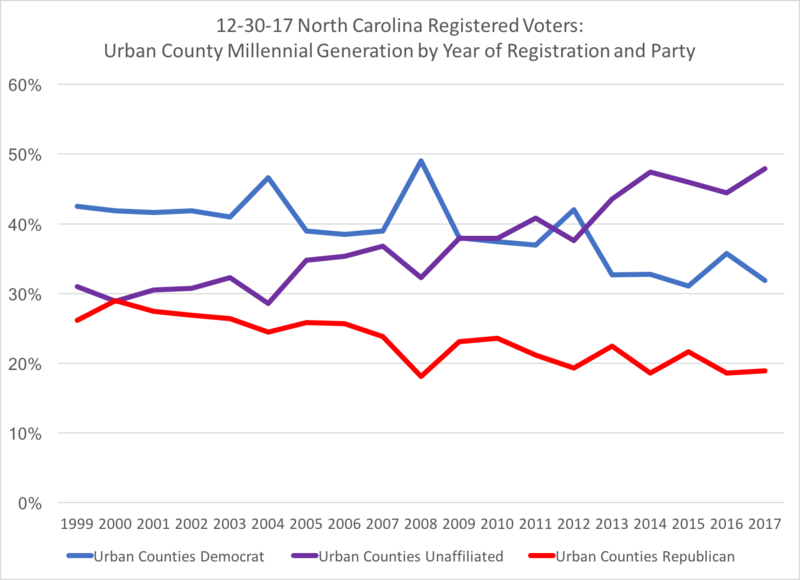 While this trend in unaffiliated status is notable, I would hypothesize that perhaps this is because of the two parties' public perceptions, rather than a distancing of Millennials from their party loyalty. 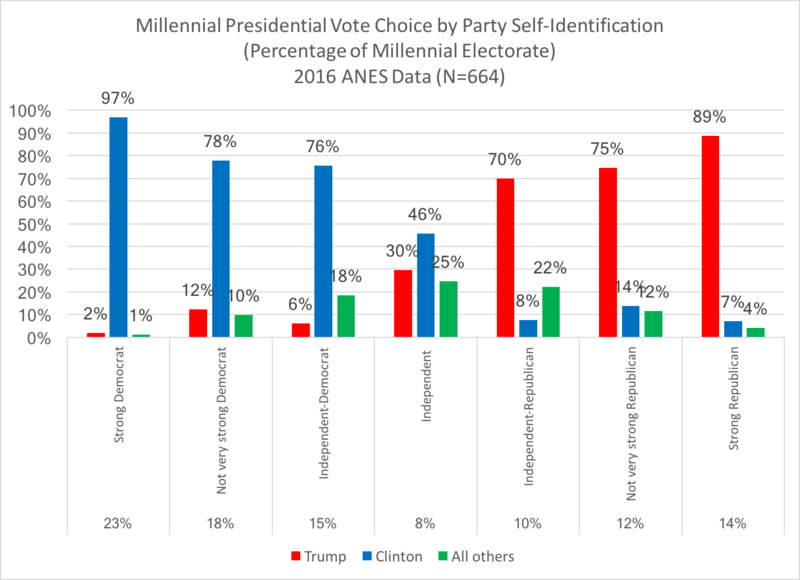 Perhaps Millennials are choosing to go "independent"/unaffiliated because of the public perceptions of the parties (polarized, divided, more ideologically coherent but unwilling to compromise), but that when it comes to party voting, from at least the national trends, Millennials are more Democratic in nature and allegiance in their vote choices, at least at the presidential level (see above chart). 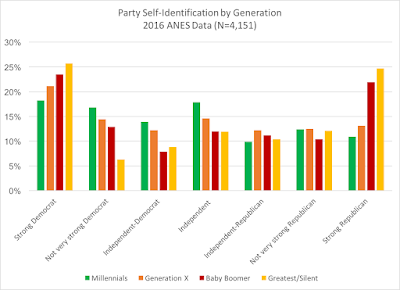 Also, I would point to the 2016 electorate that favored Democratic identification over Republican identification, with only 8 percent of Millennials identifying as "pure" independents. 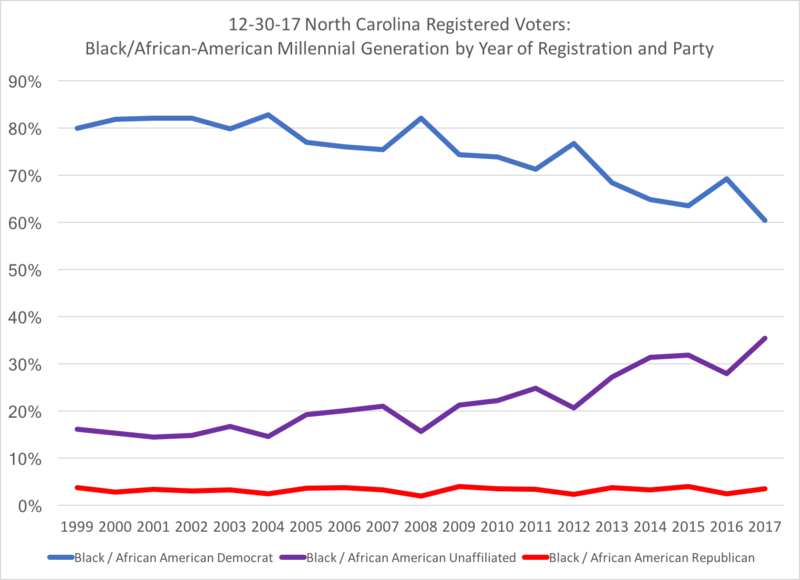 In crunching the numbers of these registered Millennial voters in NC, I broke them out into three distinct categories: regionalism (or whether a voter resides in an urban, suburban, or rural county of the state, as categorized by the Office of Management & Budget in 2015); race (white, black/African-American, and all other races), and gender. First, regionalism in the state has become another tectonic shift in the Tar Heel state's politics, with traditionally more than half of the votes coming from only 13 out of 100 counties in NC. 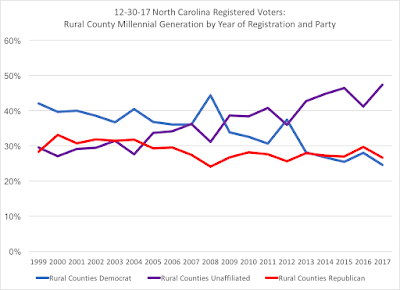 In breaking out registered millennial voters into the three county classifications, 61 percent of them reside in urban counties, with 21 percent in rural counties and 19 percent in suburban counties. 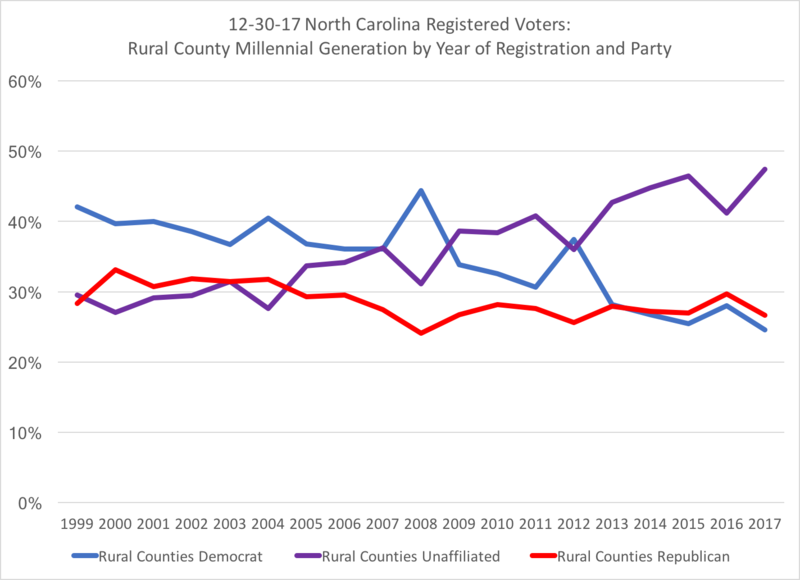 It should not be surprising that there are distinct differences among the regions of the state, with urban NC counties trending more Democratic, and suburban NC counties trending more Republican (in fact, in 2016, suburban counties were more Republican than in 2012, while rural counties held about the same from 2012 to 2016 when it came to presidential vote percentages). What is striking is that in urban counties, registered Republicans ended 2017 at 19 percent, tying 2014 and 2016 for the lowest percentages in these areas among Millennial voters. 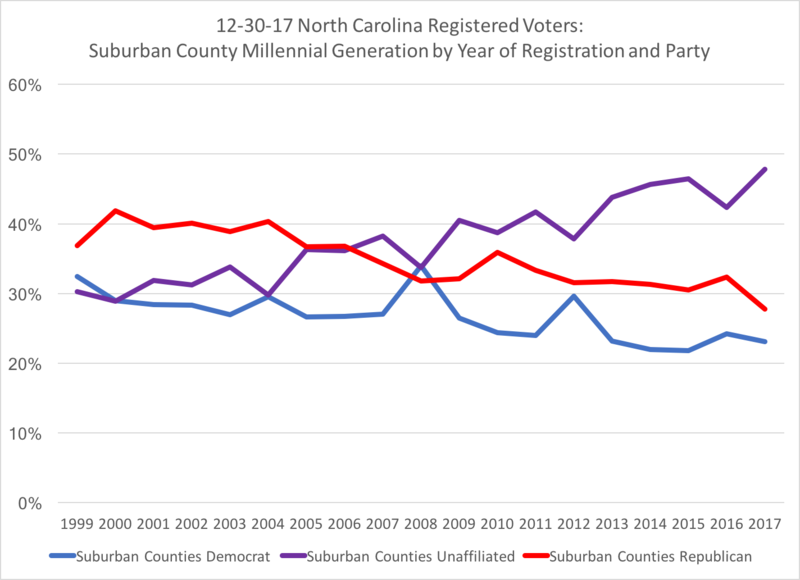 In suburban counties, registered Republicans saw their plurality decline since 2006 among Millennials, and in rural counties, both Democrats and Republicans suffered registration stagnation since 2011 to unaffiliated voters among Millennials. In analyzing based on racial composition, again noticeable trends are prevalent among white, black/African-Americans, and all other racial groups in the Millennial cohort. 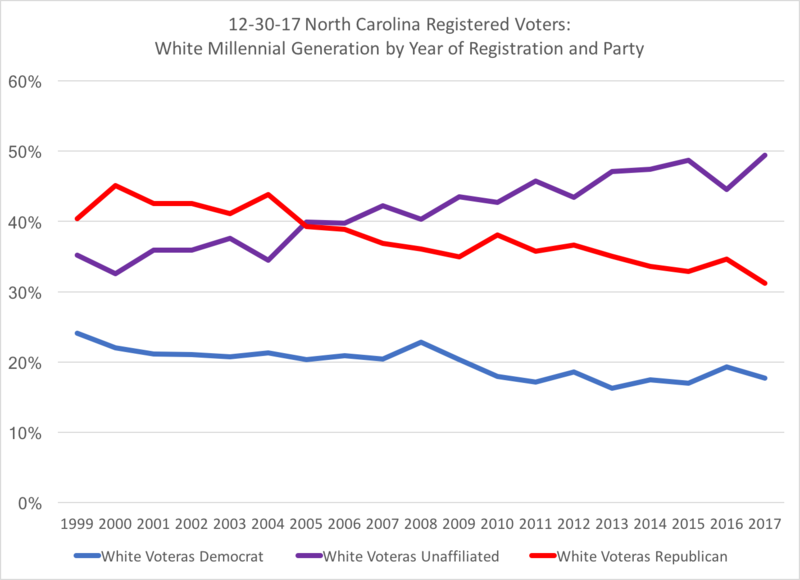 While the research in political science has shown that white Southerners are much more Republican in their affiliation, white Millennial North Carolinians have been shunning the GOP registration since 2004, and going much more unaffiliated than necessarily registering Democratic. In 2017, nearly half (49 percent) of white Millennials registered "unaffiliated." 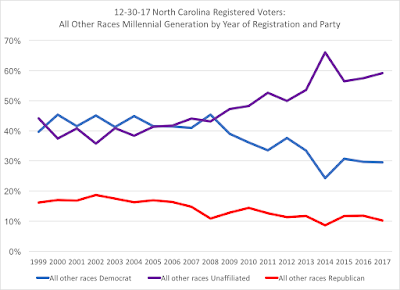 While this would be surprising to some, I think the more interesting trend line is among black/African-American Millennial NC voters: while presidential election years help to prop up Democratic registration within this cohort, the trend line of unaffiliated registration has been steadily growing since 2008. 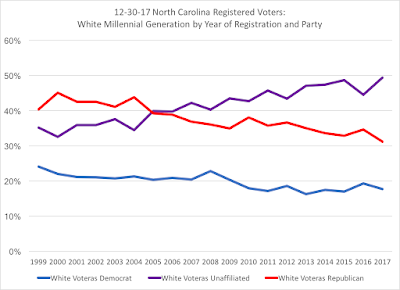 Perhaps this is the "post-civil rights era" generation that may still vote heavily for Democratic presidential and other candidates, but their party registration is breaking away from that Democratic dominance. Among all other races in the Millennial cohort, the dramatic demise of partisan registration is striking: in 2017, only 10 percent registered Republican, 30 percent registered Democratic, and 60 percent registered unaffiliated. 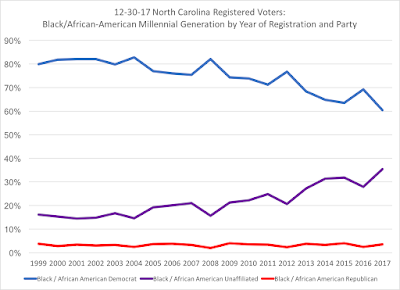 As noted in the previous blog post, NC Millennial voters are the most racial diversified cohort of any in the voter pool: 61 percent of NC registered Millennial voters classify themselves as white, 25 percent are black/African-American, and 13 percent "all others" racial groups. 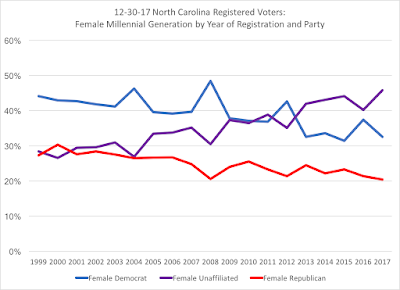 Again, the recent unaffiliated trend lines hold among both gender groups, with registered Democrats seeing spikes in election years, while registered Republicans seem to hold stead or slightly decline. 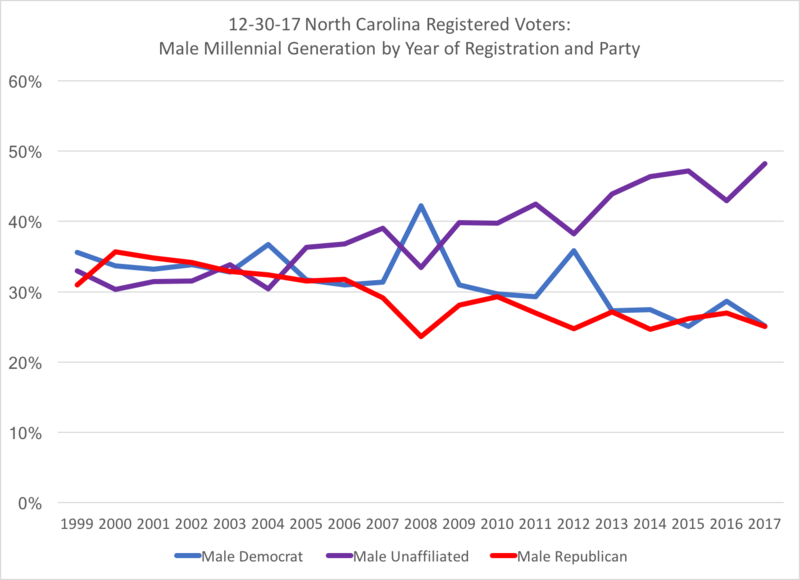 What is surprising to me is that among registered Millennial men, both Democrats and Republican registrations have been neck-and-neck over the past few years, while an obvious gap between registered Democrats and Republicans exist among women. 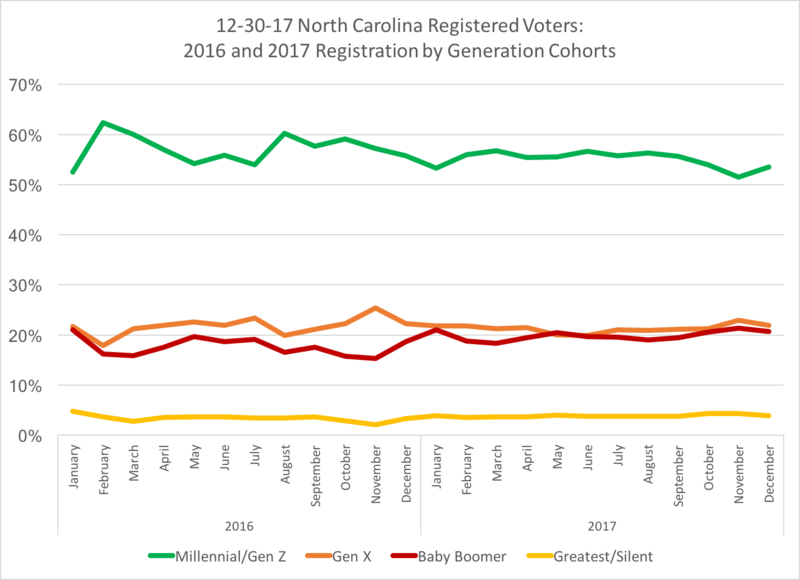 Millennials will only continue to dominate the voter registration pool, most likely meeting, and then exceeding, the number of Baby Boomers within a year's time (2018 may herald this occurrence, or perhaps leading into 2020's presidential election); but they will need to do more than just register--Millennials must improve their voter turnout rates to match older voters. The rise of the unaffiliated voter is directly tied to the rise of the Millennial voter, but while many would read this as "independence" from the two parties, voting choices are indicating a more Democratic-leaning electorate among younger voters, who may be shunning party labels and registration but are political loyal to Democrats over Republicans (see national trends as noted above). 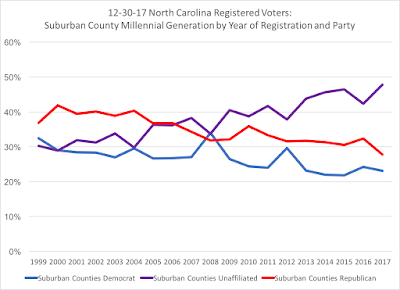 Millennial NC voters are much more urban, but as they grow older, it will be important to watch whether they move more into the "burbs" as older generations tended to do, and what political impact on NC's suburban voting patterns that may have. Racial diversity is a hallmark of the Millennial generation, and the post-civil rights era black Millennials, with their willingness to break with their parents' and grandparents' allegiance in Democratic registration patterns, will be interesting to watch. 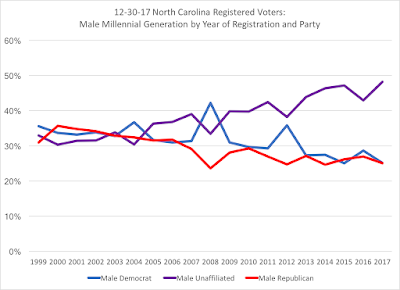 Finally, gender differences are very apparent, but the one that struck me was the 2017 match between registered Republicans and Democrats among Millennial men. 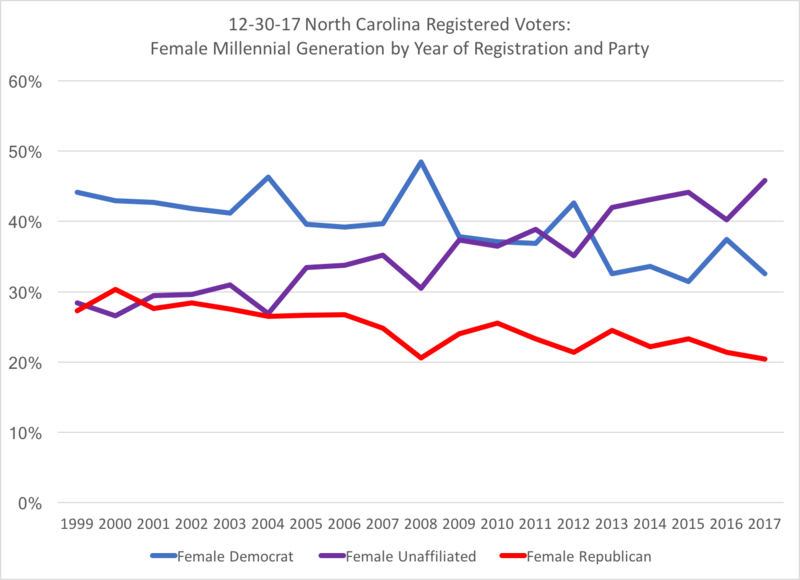 Gender gaps in voting patterns are still very apparent, but if this generation perhaps closes the divide in this area, both parties will have to consider the implications for candidates, policies, and strategies moving forward. Thanks for taking the time to read a "deep dive" post on this topic.